This recipe was inspired by Laurel Ritmiller Lucrezia of Boston. I “met” Laurel on Facebook when she informed Mass Farmers Markets (and therefore all of that organization’s friends!) that she was getting ready to make some butternut squash risotto. I was taken by the idea and asked her for her recipe. I had just used up my butternut squash so I tried a delicata instead. The butternut would probably provide squashier flavor and require more chicken stock since it’s larger. 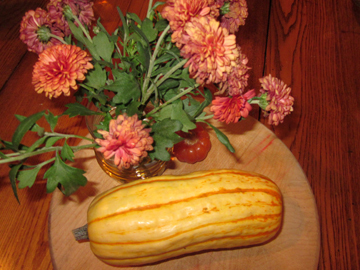 The delicata was lovely, however. 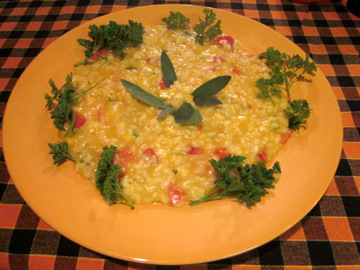 Its flavor was subtle, and it lent a gorgeous seasonal color to the risotto. Peel the squash. Cut off the ends and scoop out the seeds and the goop in the middle. Cut 3/4 of the squash into small cubes. Cut the remaining quarter into tiny julienne strips and set them aside. Pour the chicken stock into a saucepan and pop in the cubes of squash. Cover and cook until the squash softens, about 20 minutes. Let the squash and liquid cool for a couple of minutes and then puree them. I used a potato masher for this, but you could also employ a food processor or blender. 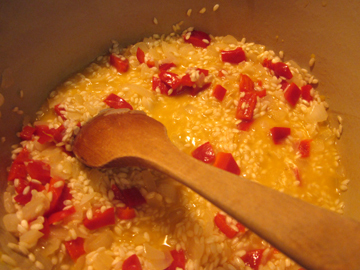 Put the squash stock into the saucepan and keep it on low heat as you make the risotto. In a heavy saucepan over moderate heat melt 1/4 cup butter and add the onion and garlic. Cook, stirring, for 5 minutes. Add the rice. Cook for 1 minute. Add 3/4 cup of the wine plus the bell pepper and carrots (if you’re using them), and stir. Add 1 cup of squash stock and keep stirring. As the mixture cooks and the rice dries up, add the remaining squash stock a bit at a time. Cooking will take quite a while–somewhere between half an hour and 45 minutes. (In my experience, the only sure-fire way to know whether risotto is done is to taste it and decide whether the rice has cooked.) If you run out of squash stock, add a small amount of water. About 20 minutes into cooking your risotto, add the small pieces of squash. Just before serving, add the tomatoes, the herbs, the remaining wine, the last bit of butter (if you want an extra rich risotto), and the parmesan. For extra deliciousness, top each serving with a wedge of chèvre. I didn’t have any in the house so I omitted this, but I’m trying it next time!